Merchandising is the methods, practices and operations used to promote and sustain certain categories of commercial activity. This is the art or buying or selling the products or merchandise. 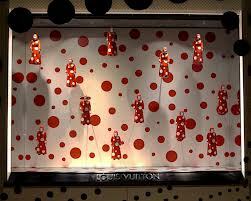 In Bangladesh, the concept of merchandising mostly refers the apparel clothing merchandising. Here the merchandise is the finished packed garment which could be tops or bottoms in formal wear, casual wear or intimate wear, also keep in consideration for home textiles, terry towels etc. 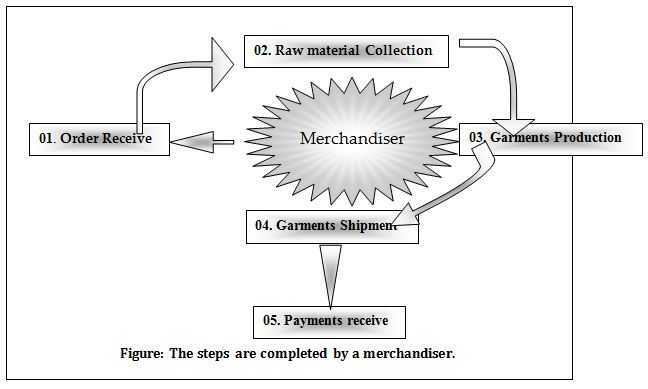 In merchandising, your role could be buying the merchandise or selling it to your buyer to keep live the supply chain. Merchandisers are serious in the success of any garment retail business. They provide the right products at the right time, enabling a company to match with latest market trends and meet the market demand. In the merchandising concept, time management is a gig to manage one’s time properly, so s/he can focus on value adding actions. An individual, who acts as a coordinator, follows-up and takes total responsibility of an order form booking to shipment and beyond, for the customer who placed it and for his company’s management. Dealing with the buyer & convincing the buyer is the main duty of marketing officer. A marketing officer also has some other duties. To take different steps by discussing with the high officials & merchandisers. To maintain a regular & good relationship between commercial officers & merchandisers. To maintain communication with the buyers and buying houses. Communicate with better knowledge of the products. Actually the responsibilities & duties of marketing officer begin from getting order of buyer & ends after receiving payment by the buyer. So, he should be always smart, energetic & sincere. Buyer sends an order copy by e-mail or sometimes swatch also. Before ultimate order a development sample is sent to buyer. Then OK the sample then price is executed. The sample is sent to buying house to check. Finally shipment is done after all clearance. 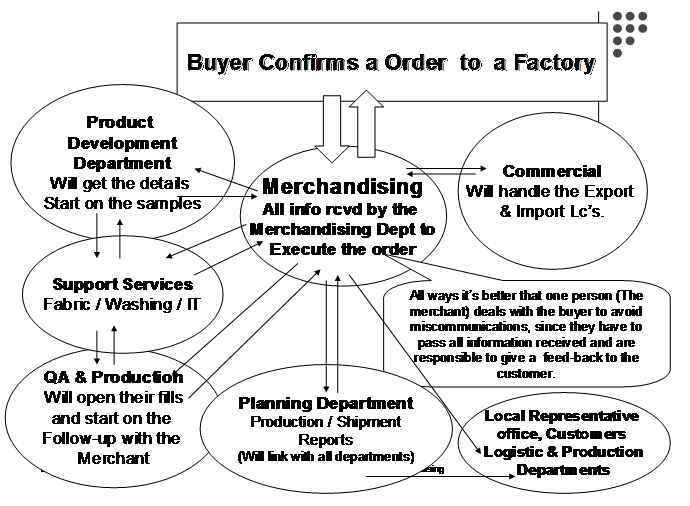 The merchandiser basically follows up with all concern production departments for their ordered products. Receiving of payment for garments. Initial planning is prepared by the merchandising department when the order confirmed. Based on the sample approval and shipment date, the production department makes the planning of the production only. The planning is done following the styling of the product and the machine lay out to calculate the number of pieces production per hour. Before production commence, pre production meeting is necessary with all concerned departments to get the correct productions. Customer wise the quality requirement will get vary and merchandisers are responsible to communicate with customers to get the correct quality requirements and need to co-ordinate with factory quality control department so that they will well understand the requirement and can take care of the bulk productions. Inspections are done during production which is called in line inspection. Later the final inspection done by the factory QC as well as buying office QC to make sure that the final products is shipping with right quality. Mentioned that, the right quality not good quality as the ‘quality’ refers to customer’s requirement. Costing is the principal task of any merchandisers. Calculate the fixed and variable costs associated with the product. Also below cost elements need to consider during costing. ~ Consumption of fabric and accessories with wastage percentage. Standards are provided by the customer and it could get vary from customer to customer. Merchandisers need to study the standard very carefully. Each style will be briefed with a product pack and all necessary information will be mentioned there along with measurement sheet. Example: If the tolerance limit in measurement specs is too low compare to production feasibility, merchandisers need to inform this to buyer before order confirmation and need to settle down the acceptable tolerance limit by both parties. LC: Letter of Credit- Once the order is confirmed, buyer’s bank issues a Letter of Credit (LC) to the manufactures Bank.n With this LC, manufactures can start procurement of yarn, fabric, accessories etc necessary for particular order execution. If the LC delayed from buyers end, it will impact on the delivery date and merchandisers need to follow this up with buyer to get the LC for on time delivery. Back to Back L/C: To procure the yarn, fabric and accessories, suppliers need to open another LC for secondary suppliers bank based on the master LC. This secondary suppliers LC is called back to back LC. UD-[Utilization declaration] suppliers need to submit master LC, back to back LC, bank certificate, BTMA certificate of yarn, Invoice of the yarn to get the UD from BGMEA/BKMEA. And to get the GSP form A, suppliers need to submit the UD and other necessary documents to EPB. This UD is mainly for the yarn procurement to show that the suppliers have procured the yarn for those particular orders. The Rupashi Knit wear Industries Ltd. has an energetic and motivated marketing & merchandising team. There are five strong merchandising units are working. The particular unit works for particular buyer. They are always in communication with the buyers. The marketing section also looks after the quality & quantity requirement of the buyers.